this pod is great! it seems to work perfectly…. do you think possible to get this pod to connect to Dynamic Streaming? That should be possible in the near future. I will try to add support for multi-bitrate at the end of the summer. Is this pod still available for download? I think the link is broken. Thanks! Yes, I made the registration link a little easier to get to on that article. Hi I am trying to use this pod to share video from a live streaming server at dacast.com. I am unable to make the initial cinnection and u think it is becuase I need to enter a user/pass. Is there any way I can enter credentials using this pod? Sorry no there is no way that i have tested but you maybe able to pass it along on the url string. 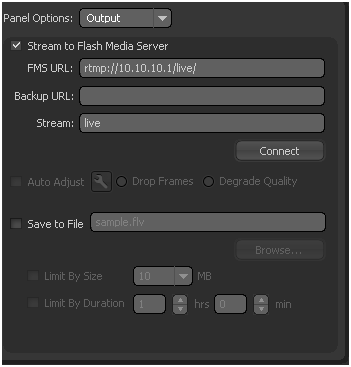 Hi, I wanted to know if it was possible to create a adobe connect pod that would allow me to use a link from Ustream. I looked at their api and it does not appear possible. 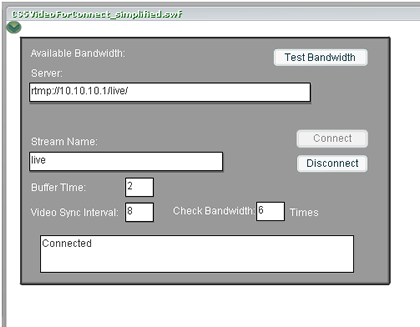 Hi I have connected to my rtmp server but I don’t see any video. the streamer is ok as I can view it with an online player using the same servers and stream settings. any idea what I can be doing wrong? Next Next post: And Its Off! Nicely Done!